One hundred buses from across the UK are to be shipped out to Indonesia and Sri Lanka as part of the Asian tsunami relief effort. 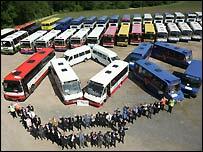 The vehicles, including double-deckers and minibuses, have been donated by bus operators over the past six months. They will be used as school buses and mobile classrooms across the region. Asia Bus Response handed them over to charity Islamic Relief at Marwell Zoo, Hampshire, on Wednesday, ahead of their shipment from Southampton next week. Government ministers from Sri Lanka and Indonesia attended the handing over of the vehicles. The scheme was set up to send out older buses that are being taken off the road here, but are well-suited to the tropical climate because of their high-floors and lack of complicated technology. In Sri Lanka, the vehicles will help children get to school in Galle, while in Indonesia they will become mobile classrooms in the Ache area. Jeyaraj Fernandopulle, from the Sri Lanka High Commission, said: "The arrival of these buses from Asia Bus Response will be seen by ordinary Sri Lankan people as the most visible and concrete benefit from the international community." Asia Bus Response co-ordinator Mitch de Faria added: "Hundreds of thousands of people were killed in the tsunami and many more lost all they had. "The UK bus and coach industry has pulled together, setting aside its own goals to help those in far greater need." Gary Hobson, a driver for Oxfordshire County Council, was one of the many who delivered the vehicles. He said: "I'm sure the people out there will find them very practical. "They're comfortable to drive, reliable and easy to maintain."